Meddbase offers a built-in central drugs database system powered by First Data Bank containing drug informration, products, packs and much more. Our central drug database is updated monthly ensuring that the system is completely up to date. 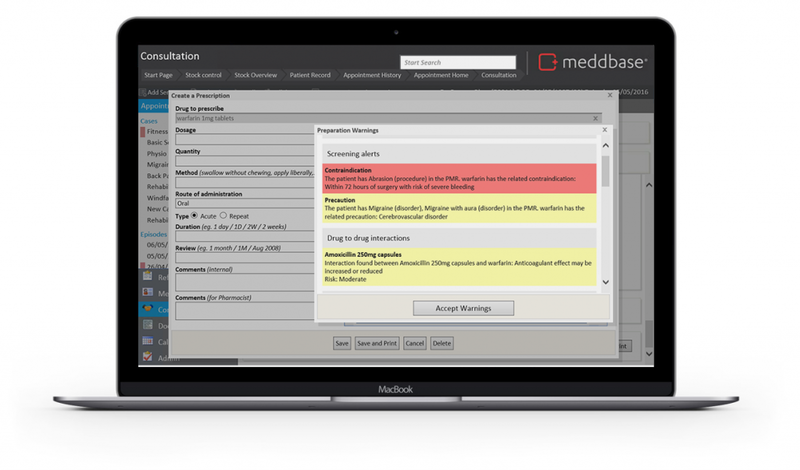 Meddbase caters for both acute prescriptions and repeat prescriptions and covers all compliance around drug prescribing. Acute and repeat prescriptions are logged against the patient record although in accordance with regulation all repeat prescriptions must be accompanied with a review date and repeat duration. If a review date has passed, Meddbase will alert the clinician to re-authorise the prescription before it can be given to the patient. Meddbase will cross check the patient record matching SNOMED CT terms captured during the clinical episode with SNOMED CT terms logged against the drug data and warn against drug to drug interactions, cautions, product warnings, contra-indications, adverse drug reactions and side-effects. Meddbase will also perform dosage checks and will warn the clinician by displaying any relevent on screen alerts. It will even check the dosage when prescribing to infants by cross referencing the prescribed dosage against the patient body surface area. Combining Meddbase, SNOMED CT and accurate drug data, we offer the ultimate solution for prescribing clinicians.